Cordoba becomes once again international epicentre of the Halal world. 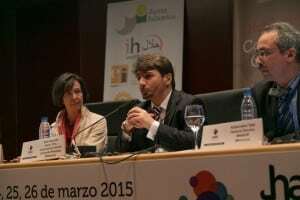 The 28th, 29th and 30th of April, the IV European Meeting of Halal Standardization will be held in Cordoba. A month after the celebration of the I International Halal Congress, fifty representatives who are working on the creation of a European Halal standard will meet in the city of Cordoba. The Halal Institute is the host institution and also maintains the technical secretariat of the National Halal Committee promoted by AENOR. Cordoba takes on a higher relevance in the Halal market. Isabel Romero Arias, General Director of the Halal Institute believes that “we have gone one step further to get closer to the reality of the Muslim community,” she explains. “We are providing an added value that is also being endorsed and supported by the institutions,” says Romero. The starting point of this meeting arises from the European Committee for Standardisation (CEN), a private non-profit organization created in 1961 and composed of more than thirty European standardization bodies with the aim of promoting the European economy and develop European standards in several sectors. The committee CEN-CTN 425 is responsible for developing the European Halal standard, which for the first will be held in Cordoba, after their previous experiences in Turkey, Austria and Bosnia. Saim Kayadibi, expert in international standardization, comes back to the city after participating recently in the 1st International Halal Congress. He is the chairman of the European Committee for Halal Standardisation. “Halal has to do with life, as a whole, because we believe that you are what you eat”, explains Kayadibi. “We have a great opportunity,” he adds, to link Cordoba with the global Halal market. The University of Cordoba welcomes the 50 representatives united under the umbrella of the CEN to its premises. This committee has been working for more than four years on the several experiences of standardization which are being carried out currently, and tries to reach a consensus on the sensitive points, such as stunning, mixed production, the use of additives, genetically modified products and the crosscutting concept of the Halal standard beyond production. A critical point to discuss during this meeting, is the possible cooperation between the main body of international standardization, the Standards and Metrology Institute for Islamic Countries (SMIIC), and the European Committee CEN-CTN 425. The SMIIC was launched by the Organization for Islamic Cooperation, and is playing a decisive role in the definition of the international standardization of the Halal market. The fourth meeting of the European Committee puts Cordoba on the map as the epicentre of Halal food, tourism and finance once again.